Summary and Definition: Doris "Dorie" Miller was a famous African-American sailor who served with distinction when the Japanese launched the surprise attack on Pearl Harbor. Doris "Dorie" Miller was a Mess Attendant Third Class on the USS West Virginia battleship. Doris "Dorie" Miller went above and beyond the call of duty during the devastating attack on the Pearl Harbor naval base in Hawaii when he took control of an unattended machine gun and used it in defense of the base. "Dorie" Miller was subsequently awarded the Navy Cross. Discover the story of Doris "Dorie" Miller and his deeds of valor on that day of infamy, Dec. 7, 1941. 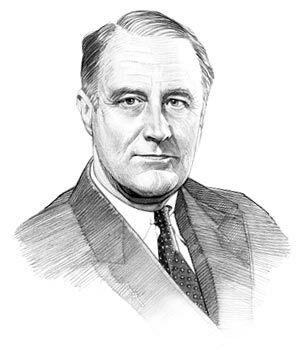 Franklin Roosevelt was the 32nd American President who served in office from March 4, 1933 to April 12, 1945. One of the important events during his presidency was the bombing of Pearl Harbor and the story of Doris "Dorie" Miller. The following fact sheet contains interesting information, history and facts on Dorie Miller for kids. Dorie Miller Facts - 1: Doris "Dorie" Miller was born on October 12, 1919, the son of sharecroppers Henrietta and Conery Miller from Waco, Texas. Dorie Miller Facts - 2: He was the third of four sons and was named by the midwife who assisted with his birth, before the birth his mother had been positive that the baby would be a girl. Dorie Miller Facts - 3: Dorie Miller attended the A. J. Moore High School in Waco but he was forced to drop out of school during the Great Depression to help out with the farming. He also managed to get part time work in a small restaurant in Waco. Dorie Miller Facts - 4: At the age of 19 years old Dorie Miller enlisted in the US Navy on September 16, 1939 hoping for the opportunity to see the world and to send money home to his family. Due to segregation African-Americans were limited in the US Navy to non-combat positions as mess attendants, stewards, and cooks. Dorie Miller Facts - 5: Dorie Miller undertook boot camp training in Norfolk, Virginia and was assigned to the ammunition ship Pyro at the Pearl Harbor naval base in Hawaii as a Mess Attendant, Third Class. A mess man was basically expected to attend to the needs of the officers and crew serving food, clearing tables and cleaning dishes. Other duties of a mess attendant included making beds and cleaning the bedroom and bathrooms of the officers. Dorie Miller Facts - 6: On January 2, 1940, he was transferred to the battleship USS West Virginia, where he became the main cook. The West Virginia lay moored at Pearl Harbor with 40 feet of water beneath her keel. Dorie Miller Facts - 7: Dorie Miller was a big man, standing at 6′ 3″ and weighing over 200 lbs, and became the Heavyweight Boxing champion of the USS West Virginia. Dorie Miller Facts - 8: On Sunday morning on December 7, 1941 Dorie Miller was up early at 06.00am earning extra money by providing wake-up calls to the officers of the USS West Virginia and cleaning their rooms. Dorie Miller Facts - 10: The USS West Virginia was hit by torpedoes almost immediately. General quarters were sounded and Dorie scrambled to report to his battle station. Dorie Miller Facts - 11: His battle station had been destroyed and he was ordered by by Lieutenant Commander Doir C. Johnson to run across the deck and help to carry wounded men to the shelter of the quarterdeck. Dorie Miller Facts - 12: News that the ship's captain, Mervyn Bennion, had been badly injured and Dorie Miller was ordered to bridge to get the captain to safety - Captain Bennion had a gaping wound in his abdomen but refused to leave his post (he later died of his injuries). Dorie Miller Facts - 13: Lieutenant Frederic H. White then ordered Dorie Miller to help him and Ensign Victor Delano to load the unmanned anti-aircraft machine guns. He was only expected to load ammo into both guns but he used his initiative and manned one of the guns and started firing into the air at the dive-bombing Japanese airplanes. The following fact sheet continues with interesting information, history and facts on Dorie Miller for kids. Dorie Miller Facts - 14: Dorie Miller had never received training in operating the big anti-aircraft guns, only white sailors were given gunnery training, but he bravely fired the gun until he ran out of ammunition. Dorie Miller Facts - 16: After running out of ammunition, still under enemy fire, he went on to help pull injured sailors out of the water to safety "unquestionably saving the lives of a number of people who might otherwise have been lost." Dorie Miller Facts - 17: The USS West Virginia was hit by seven 18-inch aircraft torpedoes and two bombs (15-inch armor-piercing shells fitted with fins). The damage was so severe that the crew were ordered to abandon ship. A short time later the great West Virginia battleship sank. Dorie Miller Facts - 18: Of the 1,541 men on USS West Virginia during the Japanese attack, 130 were killed and 52 were wounded. The battleship had been struck by 9 Japanese torpedoes. Dorie Miller Facts - 20: The first reports of the attack on the USS West Virginia made reference to the brave actions of an unidentified African-American sailor. He was later identified as Doris "Dorie" Miller and awarded the Medal of Honor. Dorie Miller Facts - 21: On May 11, 1942 President Roosevelt approved the Navy Cross for Dorie Miller which was presented to him on May 27, 1942 by Admiral Chester W. Nimitz, Commander in Chief, Pacific Fleet, aboard the aircraft carrier Enterprise. Dorie Miller Facts - 22: The famous Dorie Miller deeds of valor became well known and the African-American hero became a role model for many young Americans and was featured on recruitment posters carrying the words "December 7, 1941 - Remember!". Dorie Miller Facts - 23: His fame was such that he was included in a war bond tour and gave talks from Great Lakes Naval Training Station, in Chicago, Illinois. Dorie Miller Facts - 26: In the early hours of 24 November, 1943 the USS Liscome Bay was sunk by the Japanese submarine I-175. There were only 272 survivors and the rest of the crew, including Doris "Dorie" Miller was listed as “presumed dead”. parents were notified their son’s death on December 7, 1943, exactly two years after his acts of heroism during the Japanese attack on Pearl Harbor. Dorie Miller Facts - 27: The life of this young African-American hero has been honored in many ways. Orson Welles presented a radio tribute to Dorie Miller broadcasted on April 25, 1944. And he has been portrayed in films including the 1970 movie Tora! Tora! Tora! in which he was portrayed by Elven Havard and the 2001 movie Pearl Harbor in which he was portrayed by Cuba Gooding, Jr.
Dorie Miller Facts - 28: In February 2010 the US Postal Service issued a set of four commemorative first class 44-cent stamps honoring "Distinguished Sailors" from the nation’s history. The four sailors honored included Doris "Dorie" Miller. Dorie Miller was recognized as one of the first US heroes of WW2 and was commended in a letter signed by Secretary of the Navy Frank Knox on April 1, 1942. On May 11, President Franklin D. Roosevelt approved the Navy Cross for Dorie Miller. He was subsequently presented with the Navy Cross on May 27, 1942 by Admiral Chester W. Nimitz, Commander in Chief, Pacific Fleet, aboard the aircraft carrier Enterprise. This article provides detailed facts and a summary of one of the brave men who fought at Pearl Harbor during his presidential term in office. The following Franklin Roosevelt video will give you additional important facts and dates about the political events experienced by the 32nd American President whose presidency spanned from March 4, 1933 to April 12, 1945.